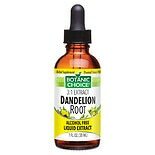 Shop Botanic Choice Dandelion Root Herbal Supplement Liquid (1 oz. )1 oz. 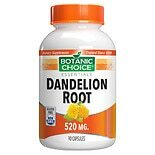 Shop Botanic Choice Dandelion Root 520 mg Herbal Supplement Capsules (90 ea. )90 ea. The dandelion plant is an herb even though many people think of it as a weed. What many people don't know is that dandelions are full of vitamin A, B, C, and D. They are also full of iron, potassium and zinc. Dandelions have been used as both food and as medicine for years. Their greens are used for fresh salads and soups. They are often dried and ground down along with their roots to brew teas used as medicine. Wines are made from the bright yellow flowers of this plant. Native American people used dandelions as medicine. They were used in teas to treat kidney problems, skin problems, heartburn, and upset stomach and to reduce excess body fluid. The Chinese used dandelion to treat stomach problems, and breast problems, such as swelling and lack of milk flow. In Europe, dandelions were used to treat fever, boils, eye problems, diabetes, and diarrhea. Today, the roots are used primarily to boost appetite. Dandelion leaves are also still used to help rid the body of excess fluid. Although dandelion can be included as part of your diet, many people don't like the idea of eating something they think is a weed. In addition, dandelions can be very bitter and many people don't like their taste. 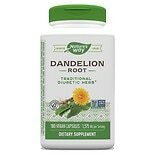 Many people prefer to use a supplement in order to get the benefits of dandelions. Dietary supplements can help you get the health benefits of a type of food when you can't or prefer not to eat it. Supplements can be vitamins, minerals, herbs or amino acids. Walgreens has many different kinds of supplements to meet your needs. These include liquid forms, capsules, and tea bags. Review all of the options and choose one that appeals to you. You should always talk to your doctor or pharmacist before you begin taking a supplement. All supplements carry the risk of causing side effects. Talk about your past and present medical problems. Include all of your medicines, prescriptions, over the counter medications, and supplements. 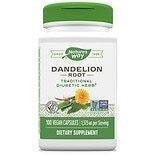 Your doctor or pharmacist can help you find the right dandelion supplement to meet your needs. This summary is intended for general informational purposes only, and should not be interpreted as specific medical advice. The U.S. Food and Drug Administration does not strictly regulate herbs and supplements. There is no guarantee of purity, strength, or safety of the products. As a result, effects may vary. You should read product labels. In addition, if you are taking medications, herbs, or other supplements you should consult with a qualified healthcare provider before taking a supplement as supplements may interact with other medications, herbs, and nutritional products. If you have a medical condition, including if you are pregnant or nursing, you should speak to a qualified healthcare provider before taking a supplement. Consult a healthcare provider immediately if you experience side effects.